Ellery Eskelin, Susan Alcorn, Michael Formanek. Sometimes just reading the names in certain line-ups sends one’s brain into paroxysms of excitement. Eskelin felt the same way as he pulled the group together in Baltimore—tenor saxophone, pedal steel, bass, and more notably, the personalities behind them—whatever the result, you’d be hard pressed to say it wasn’t at least interesting. The pedal steel has been so heavily appropriated by the popular country genre that, at least for Americans, it’s difficult to hear the instrument without having your ears automatically retuned to country western frequencies. Susan Alcorn has done much to remind us that the pedal steel is more than just a splash of twang and color—she’s made the instrument truly non-idiomatic, to borrow Derek Bailey’s terminology. But unlike Bailey, Alcorn’s concern never seemed to be avoiding idioms—only with fully exploring the potential of an instrument that’s often boxed-in. Eskelin and Formanek have never been overly concerned with perceived idioms, either. Those who care to might pin them to jazz, but they are both from what was perhaps the first generation of modern jazzmen who were more concerned with digesting and integrating a wide spectrum of creative music than where they were pegged on some jazz continuum. While Wynton Marsalis railed, they forged ahead. 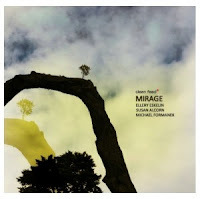 Nearly thirty years on, the mix on Mirage is as natural as it is unusual. The group creates an interesting counterpoint; the three instruments are so dissimilar in sound, this isn’t a music of easily blended sonorities. Rather, they tend to form more of tripod that bolsters the improvisation, three distinct legs doing their best to hold up the billows and rolls of the work. Still, there are occasions when the three stretch to mesh their sounds together. In “Divergence,” Eskelin and Formanek do just the opposite, converging at the end into a low, richly resonant register. “Meridian” starts slowly with a lovely bass and pedal steel duet, Alcorn’s guitar taking on a sour tone when it ventures into more dissonant territory. In “Absolute Zero,” she could almost be mistaken for some old-timey clarinet, and later on, steel drums, or early, whizzing synthesizers. Mirage was recorded mostly without an audience at Towson University’s new Fine Arts Center. However, the centerpiece of the album, “Downburst,” is a nearly 30 minute live performance, a vortex of shifting pitches that is easily the strongest display of the group’s synergy.Throughout, Eskelin’s breathy tenor brings a warm, lyrical quality to these freely improvised pieces, a beautiful foil to Alcorn’s haunting, melancholy abstraction. Mirage makes the most of its unique palette of instruments and personalities. At this stage, we know well the high quality that can be expected of a project when Eskelin and Formanek are involved. And, though she’s certainly no stranger to some of the big names in free improvisation these days, hopefully this Clean Feed release will raise Susan Alcorn’s profile with fans of this music, too. I think this is a beautiful album, with indeed a complete repositioning of the pedal steel guitar which sounds absolutely fascinating here.